One of the most powerful benefits of building a website on the HubSpot COS is HubSpot's commitment to regular product releases that enhance user experience and make website management easier and more efficient. Over the years, HubSpot's product releases like responsive templates, smart content, personalization, and search functionality (to name a few) have changed how marketers approach website content and design. In short, the HubDB is HubSpot's relational database. Unlike other databases that must be built and maintained by IT, HubDB allows developers to create database-driven content that can be embedded within websites and landing pages. Website functionality built with HubDB can then be handed over to marketers to easily maintain. If you have ever worked with spreadsheet software like Excel, HubDB functions much the same. HubDB uses a table database structure that allows you to add data in rows and columns. You'll start by setting up tables in HubDB. The interface is easy to use and allows you to add columns and rows. You can customize what goes in each column by adding rich text, single line text, numbers, images, times, dates or locations. You can even incorporate latitude and longitude for office or store locations. Using dynamic pages, HubDB also gives you the ability to create a page for every row in your table. Each of these pages includes an SEO-friendly URL along with page-specific analytics. With a developer’s help, you can also use HubDB to build templates. If you have a design, you can set up dynamic templates which will pull in content for you. Any part of your website that needs to be regularly updated and is referenced across your website is a good application of HubDB. Since its release, we have utilized the HubDB with our own LyntonWeb website and across a number of our client's websites. Our About Page HubDB generates data for our team module allowing us to easily add team members. We can also edit team members' descriptions, social media links and update their photos. Many company websites include a section or page highlighting team members. Using HubDB is a great use case for managing team member bios and photos. Each row in the HubDB will be dedicated to a team member. You can simply add or remove lines, similar to managing an Excel document. Information you can include in HubDB for team members is a photo, bio, social media icons, department, fun facts, relevant links and more. 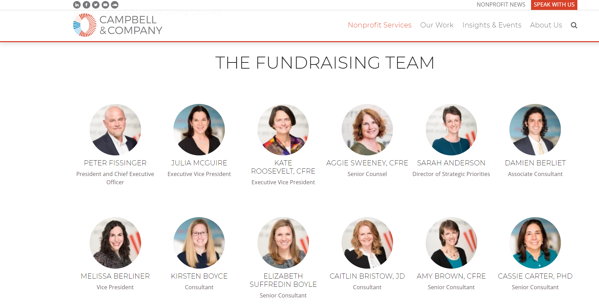 We recently switched, our client Campbell & Company from a static team member section to a dynamic one. This has let them easily manage team members across their website. Below you see their main team page built on HubDB. HubDB lets us pull the team page data through to other pages by category - like their fundraising page. HubDB also lets us generate individual team member pages from the same database. With HubDB you can build the database and add content once and then deploy this content across your website in a variety of ways. Our LyntonWeb Resources page is another example of HubDB. You can search by both topic and resource type. We typically recommend a resource page as a centralized location for advanced content. Events pages are another powerful way to use HubDB. The Campbell & Company events page can auto-generate every single event page and also pull individual events into specific website pages as needed. Pricing pages are another great example where HubDB can come into play. Our Integrate HubSpot pricing page lets us quickly add new services and update our pricing options through the HubDB interface. We built product pages using HubDB for our client RF Venue. RF Venues antenna's page is a HubDB generated page that lets you view product specifications and pricing with the option of purchasing the antenna online from a list of retailers or purchasing from a dealer. RF Venue's product pages showcase an effective way to incorporate and e-commerce aspect to your site without the need to install full-blown e-commerce software. We partnered with Habitat for Humanity East/Bay Silicon Valley to build out a searchable home repair services page. Website visitors can select their county and city to see if services are available in their area. Habitat for Humanity can easily update their HubDB when new services become available for cities. What HubSpot portals have access to the HubDB? HubDB is available to MarketingHub Basic, Professional, or Enterprise customers with a paid website add-on of $300+. Marketing Hub accounts with a Starter or trial version of the website add-on do not have access to HubDB. If you have any content that needs to be regularly updated and categorized on your website like team pages, events, resources, products and services, HubDB is a solution you should consider. If you're interested in learning more about HubDB or implementing HubDB on your website, schedule a consultation with us.